Canadian Space Agency astronaut Chris Hadfield gave a first look at the Soyuz TMA-07M crew patch today on Twitter. 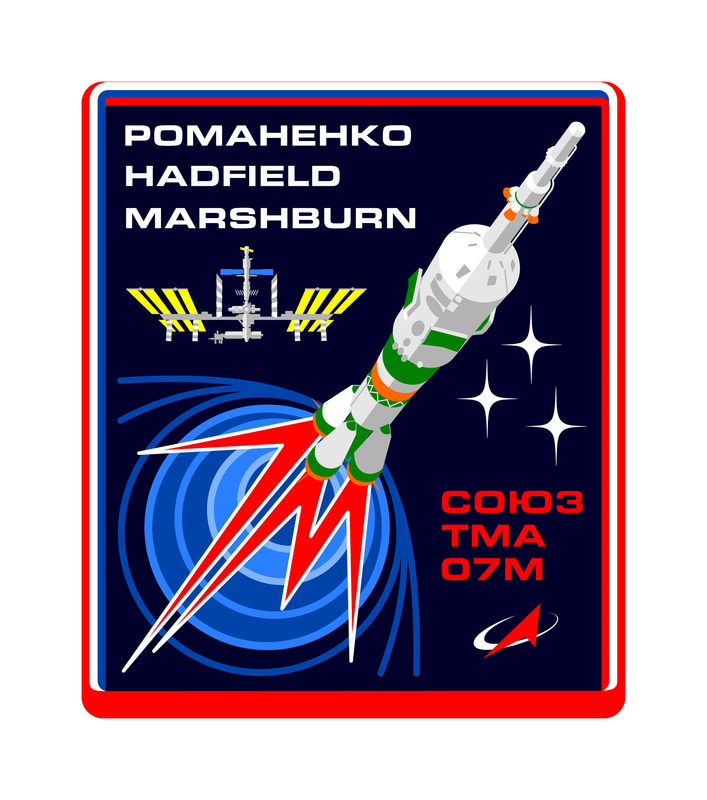 Our crew Soyuz patch just came out. We love it! Soyuz TMA-07M, currently scheduled to launch on Dec. 5, 2012, will deliver Roscosmos cosmonaut Roman Romanenko, NASA astronaut Tom Marshburn, and Canadian Space Agency (CSA) astronaut Chris Hadfield to the International Space Station to join the Expedition 34 and Expedition 35 crews. The top version was probably created at JSC to simulate embroidered patches in the crew portrait. You don't see the Soyuz launch vehicle too often on a patch. I love how they incorporated "7M" as a stylized flame coming out of the rocket!!! Great design! I look forward to adding this to my collection. Erik did an outstanding job on designing this one! Correct me if I'm wrong, but the last time I remember the Soyuz launch vehicle on a patch was Expedition 9. I may be wrong. Have to review all the patches since this one. And since Marshburn is my hometown hero I have to get this one. When will it be available? Romanenko got his rocket at last! Great patch Erik. Where can I get one of these patches? Being Marshburn is a native of my town I have to get one. 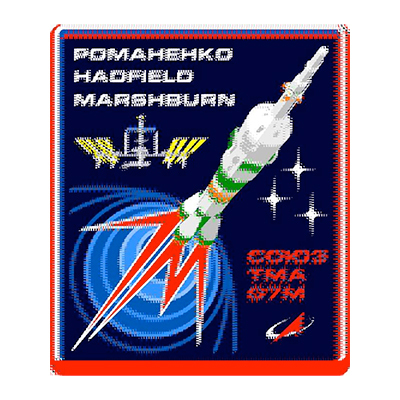 Now that Soyuz TMA-07M is in the history books, here is the story of the patch. In 2001, I talked to Cece Bibby, the 'mother of all space art', about the designs she had painted on the Mercury capsules back in 1962. She told me some wonderful stories, some of which were later published on her website and used by others for some nice articles. What stood out to everyone, was her wry sense of humor and her love for practical jokes. 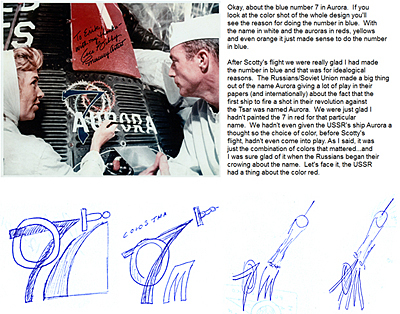 One of the biggest surprises she had for me, was that the '7' on Scott Carpenter's Aurora-7 had been blue. Cece explained to me that she was glad she had not painted it red (as I somehow believed it had been), because Aurora turned out to be the name of the ship that had fired the first round in the Russian Revolution. "The USSR had a thing about the color red," she noted. In 2004, through Spacepatches.nl, I got involved in Luc's Soyuz TMA-4 patch. It looked as if he would also get his hands on TMA-7, so I told Cece that I would try to smuggle a red seven into it. She (and Luc) cheered the idea, but in the end, we never got to design TMA-7. Alex Panchenko would reign the Soyuz patch world from Soyuz TMA-5 to TMA-11. Luc and Spacepatches.nl got back in the Soyuz patch business in late 2008. Soon, together with Jacques, I found myself somewhat in Cece's footsteps, designing a logo for a real spaceflight: Roman Romanenko's Soyuz TMA-15. We had planned to use a Soyuz rocket in it, but eventually, it had to make place for a piece of children's art - an angel. In late 2010, Roman was assigned a second flight and it happened to be Soyuz TMA-07M. The launch was scheduled for 2012; 50 years since Cece had decorated Friendship-7, Aurora-7 and Sigma-7. I instantly knew I would use her artwork and a red seven as a starting point for the design. Very early in the sketching process, I discovered that a Soyuz rocket would fit in nicely... and the pieces of the puzzle fell together. The crew approved the logo in the Summer of 2011 without requesting any changes. It was revealed on Twitter on July 31, 2012, by Chris Hadfield. Unfortunately, I was unable to share with Cece the news of 'her' red 7 making it into Earth orbit aboard a Russian spaceship. She died on November 14, 2012, a month before the launch. But this one, yours, is a sweet, sour and very very nice story. Congratulations Erik, Luc and Jacques. An awesome tribute Erik, to the original space emblem artist. That is amazing!! It's a fantastic patch Erik! Congratulations!! Erik - One of the best patch stories ever! Congratulations on paying tribute to the First Lady of Space Patch Artists.